Upon arriving in Brighton, I ventured a few steps from the bus station and discovered the gorgeous sight found at the pier around sunset. The seagulls were circling from what seemed like every direction, the lights were flashing and the people acted as if like the chilly winds of February on the coast didn’t bother them. To my loyal followers, I apologize for the delay in getting the first post up since my travels began, but I’ve finally settled a bit and it’s time to start posting again. I hope you are all keeping well in your corner of this globe! This will be a couple of weeks of update until I can muster the courage to keep adventuring to bring you more escapades around the world. Next up should be Europe with my cousin! Of my many trips to London, I’ve only been up on the London Eye once. This photograph was taken in March of 2007 and it remains a favourite of mine taken in the city of London. The haze around the city mixes with the colours of the sky so beautifully that it makes me pause every time I rediscover this picture. Big Ben and the Elizabeth Tower surrounding the bell, as well as all of the Parliament buildings seem to stand out against the rest of the city, along with Westminister Bridge. I hope you enjoy it. Thanks for stopping by! During my most recent visit to the UK, I decided to stop in to visit a friend I had made at a festival in California the year before. She lived in Royston with her son and in nearby Cambridge, I had an experience I will never forget! Take a look at the photo below.Yes, what you’re seeing is correct. The neck of a guitar sticking out of a trash bin. Playing that neck is the arm of a man. A man who is inside the garbage, playing, as well as singing. 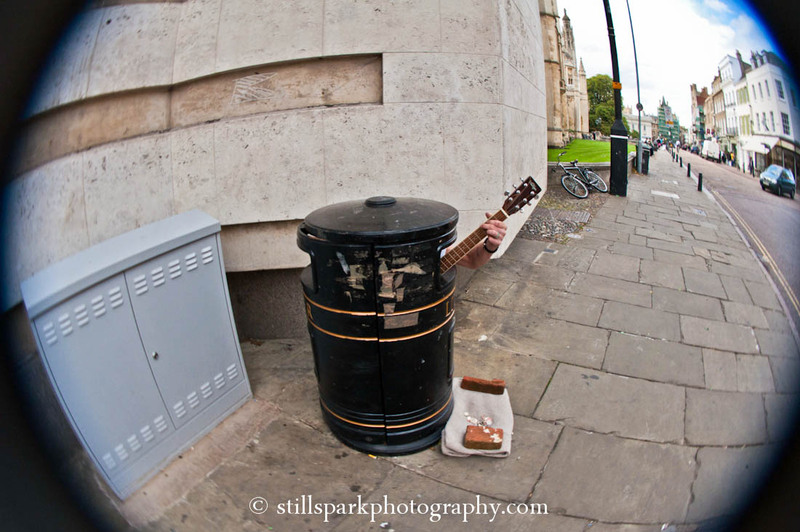 By far the most original busker I have ever encountered! Cambridge, England. Busker singing and playing guitar in a trash bin. I was shocked and amazed! During my last couple of days in Europe, I hung out with a guy I met at a festival a month or so prior. 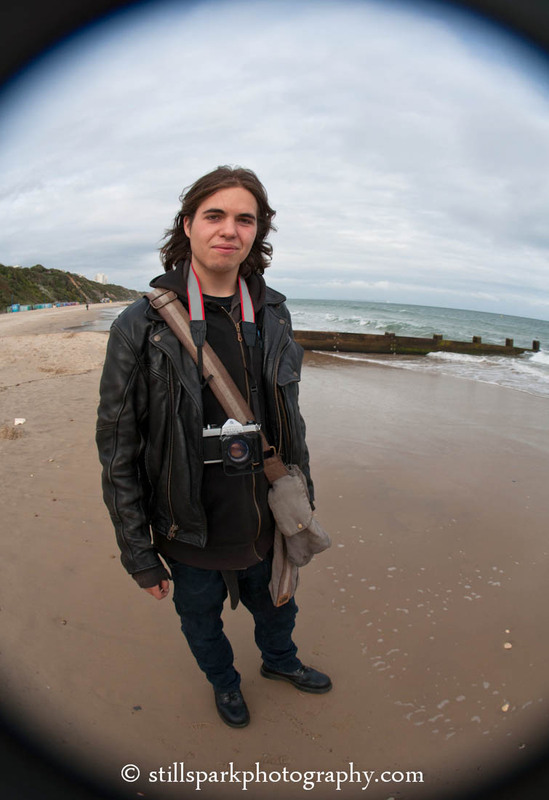 Bournemouth is a place renowned for the beach and this photo seems to capture my friend’s personality well. Bournemouth, England in September 2011. For the first 7 days of each month, I like to do a photo-essay with a theme picked by my audience. This month, it will be bridges in fish-eye. Categorized by city in alphabetical order, lastly, we end up London to check out Tower Bridge, as highlighted in Day 2: February 23, 2012: London. This time, it’s a more standard shot of the bridge, but with the twist that fish-eye adds. As I was going through photos to choose the 7 for this week, I contemplated not using this, but the soft lighting for the sun complimented the blue and white sky and bridge so well that I had to. It fits the theme too perfectly! 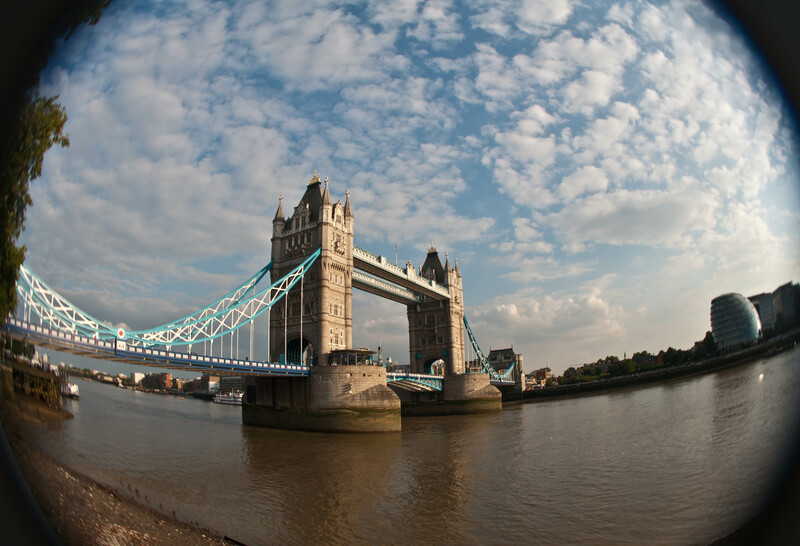 Tower Bridge in London, England, which spans the River Thames. Don’t forget to have your input on the theme for the month of April! Poll #2 coming March 23rd! 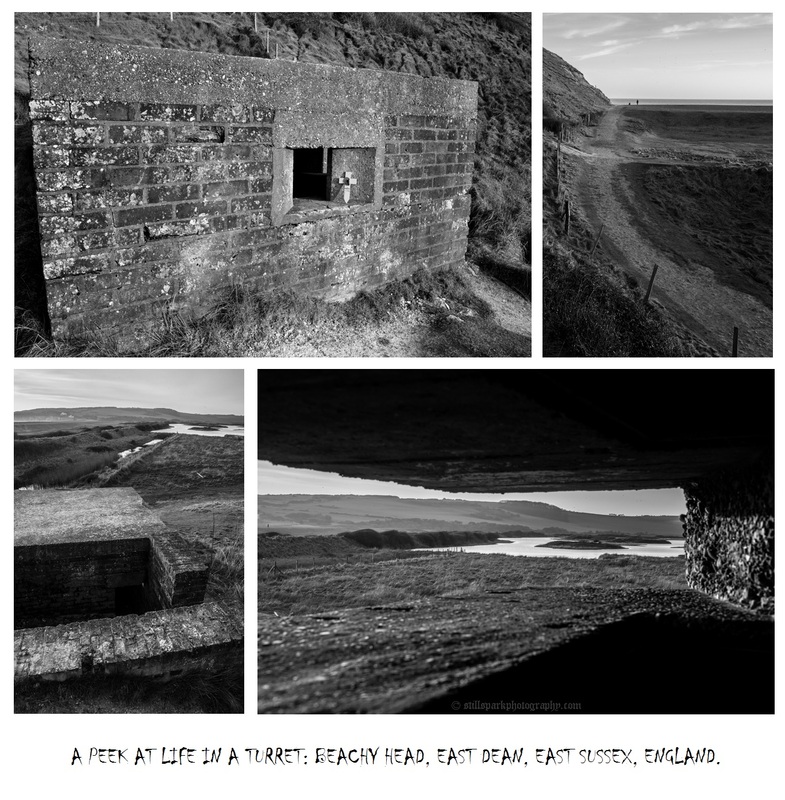 For the first 7 days of each month, I like to do a photo-essay with a theme picked by my audience. This month, it will be bridges in fish-eye. Categorized by city in alphabetical order, we continue in Cambridge, England where the River Cam is found below the Magdalene Bridge. 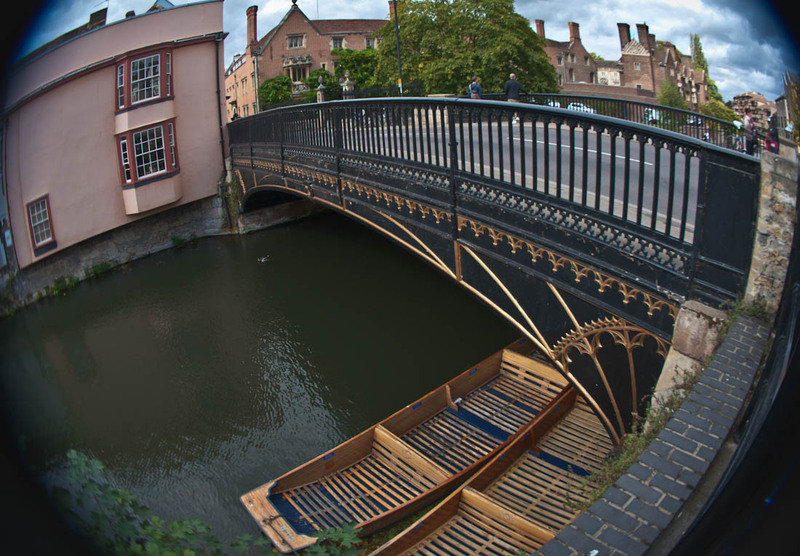 Due to the river under it and the city, the bridge is originally know as the Cam Bridge, although it is far from the city’s most famous bridge. Notice the little boats or “punts” in the right bottom corner, as they are a common sight in Cambridge. Magdalene Bridge in Cambridge, England with the River Cam flowing below.